IBM Security Access Manager for Enterprise Single Sign-On Software Call for lowest Price! Log into all your applications with a single password. IBM Security Access Manager for Enterprise Single Sign-On(previously IBM Tivoli® Access Manager for Enterprise Single Sign On) can help reduce help desk costs, improve productivity and strengthen security. Enhance strong authentication choices with support for hybrid RFID smart card and national ID cards. Epic adapter combined with RFID badge provides healthcare customers with seamless single sign-on and instant access to Epic applications. IBM Security Access Manager for Enterprise Single Sign-On (previously known as IBM Tivoli Access Manager for Enterprise Single Sign-On or TAM ESSO) is an access management solution that enables users to log into all of their applications with a single password. Security Access Manager for Enterprise Single Sign-On automatically tracks and audits user access to information, so compliance reporting is also simplified. It can help organizations reduce costs, strengthen security, improve productivity and address compliance requirements by removing the frustration of multiple passwords and eliminating complex password management policies. Security Access Manager for Enterprise Single Sign-On provides single sign-on to most application types and across enterprise network access points, such as physical and virtual desktops, shared kiosks, Citrix servers, and web portals. Security Access Manager for Enterprise Single Sign-On extends single sign-on to different environments with session management, including support for shared (kiosk), roaming and virtual desktops, for improved user efficiency and application security. IBM Security Access Manager for Enterprise Single Sign-On V8.2 offers wide platform coverage, strong authentication enhancements, and simple deployments. It introduces 64-bit operating system and application support, a virtual appliance for easier installation and delivery of the server, and expanded support for smart cards. BM Security Access Manager for Enterprise Single Sign-On V8.2 is available in four packages: Standard, Suite, Standard (virtual appliance), and Suite (virtual appliance). 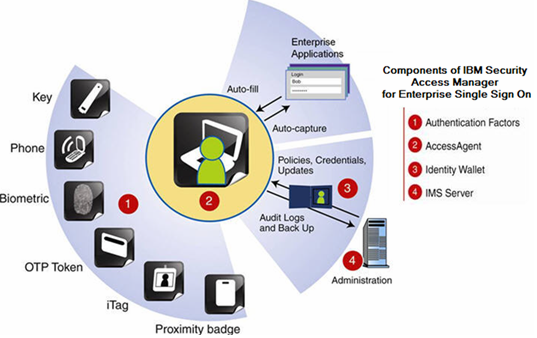 Security Access Manager for Enterprise Single Sign-On also integrates with IBM Tivoli Identity Manager for user provisioning to provide an integrated identity and access management solution for organizations. As of April 2012, IBM Security Access Manager for Enterprise Single Sign-On offers support for Epic Software applications through a no-cost adapter from IBM. The adapter is designed to provide users with faster time to information and greater productivity through seamless single sign-on. Used in combination with RFID building access badges, the adapter allows clinicians to tap in with their badge and get instant access to Epic on their desktops or kiosks. IBM Security Access Manager for Enterprise Single Sign On also contributes to healthcare organizations' efficiency by demonstrating HIPAA compliance via fine-grained audit logs and centralized auditing and reporting capabilities, as well as comprehensive session management for kiosk or shared workstation environments. Download the IBM Security Access Manager for Enterprise Single Sign-On Datasheet (PDF).